Teaching–theme in literature can be quite difficult at the elementary level. As a third grade teacher, I have struggled with this for years before figuring out how to make these concepts more tangible for my students. Here are some important things to consider when planning instruction. It wasn’t until I decided to change my approach, that I realized the graphic organizers I used were part of the problem. 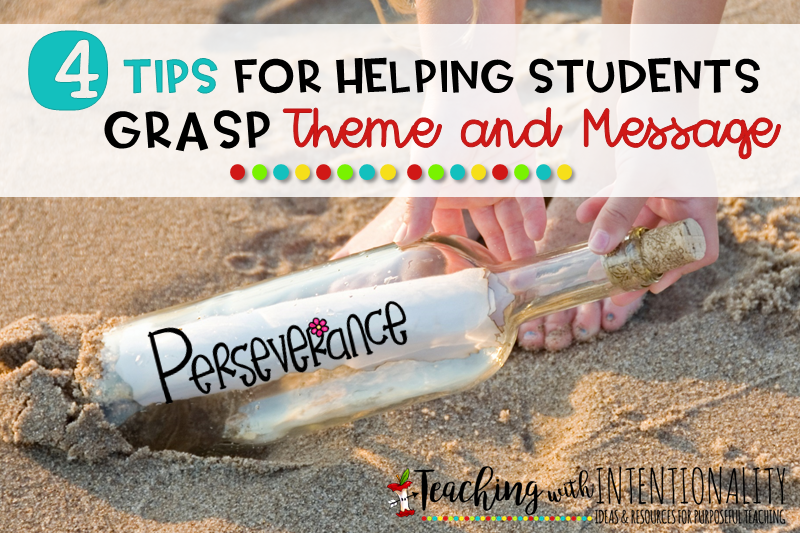 Many of us are familiar with the typical organizers: The ones that have three or more boxes labeled “detail,” and then a box at the bottom labeled “theme” or “message.” These were too vague and offered my students little guidance as we muddled through. Though I modeled and modeled, it was still too hard for them to independently identify which details were key in helping them determine the theme or message. I needed something more specific to guide my students. Obviously, reading standards cannot be taught in isolation if students are going to be able to determine the theme and central message. 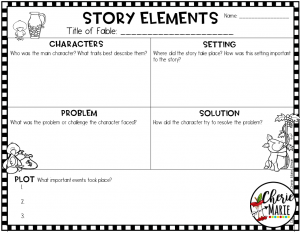 Students need to be able to dig deeper into the text by examining story elements, especially the main character, the problem, and the character’s response to the problem. They also need to be able to evaluate the character’s actions and how these influence what happens to the character at the end, as herein lies the message to the reader. 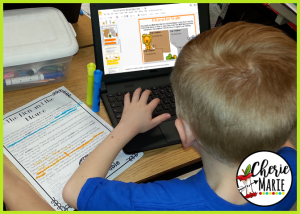 Graphic organizers that are more specific in guiding students’ thinking are exactly the types of tools students need to be successful determining theme and message. I love the Somebody, Wanted, But, So, Then method. 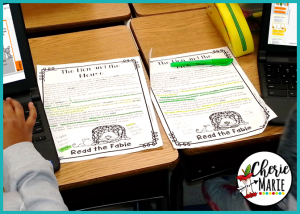 It’s such a great way to help students summarize the text. 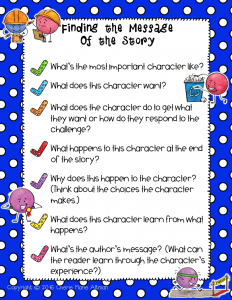 We can take this format a step further by embedding questions within this organizer to help students think more critically about these story elements. I’ve created a SWBST organizer that does just that. Notice below how the organizer asks the students to be a little more specific with each part. 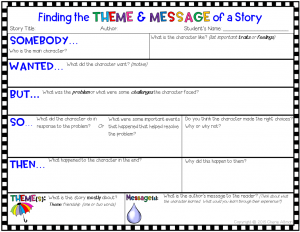 As students work through this organizer, it guides their thought process in determining the theme and message of the story. 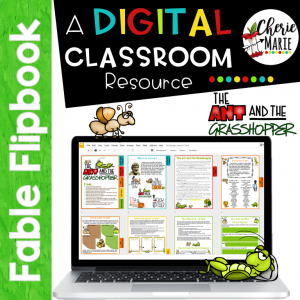 *To have access to this resource and many other fabulous freebies found exclusively on this site, sign up for my free resource library on my homepage. Understanding theme and message can be made simplified by asking students the right questions in a sequence that helps them process. If students can think through these series of questions, they are more likely to be able to determine the theme and message. Here are six simple questions that guide students’ thinking so they can determine the message of the story. What happens to the character at the end of the story? What does the character learn from what happens? What can the reader learn through the characters experience? It’s so important for students to make the distinction between the last two questions. What the character learns and what the reader can take away from the story are two very different questions. 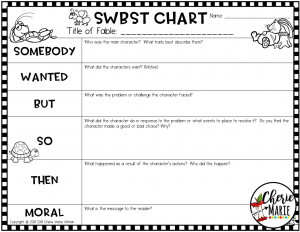 Students need to be able to extend the character’s lesson so that it applies to life in general. For example, in the fable The Ant and the Grasshopper, Grasshopper learns he should have prepared for the winter. However, students need to take it a step further and think about how this can be applied to their own lives. The moral of the story is much broader than preparing for winter. It’s a story about being prepared in general or putting first things first, whether it’s doing your homework, studying for a test, getting ready for a trip, etc… This takes some practice for my third graders, but by October or November students are grasping it. Selecting the perfect read aloud to teach theme and message makes all the difference in the world. Start with stories that have a clear theme and message. Fables are so useful in teaching this standard. I like using fables without the morals stated in the text because this allows students to work through the questioning above. 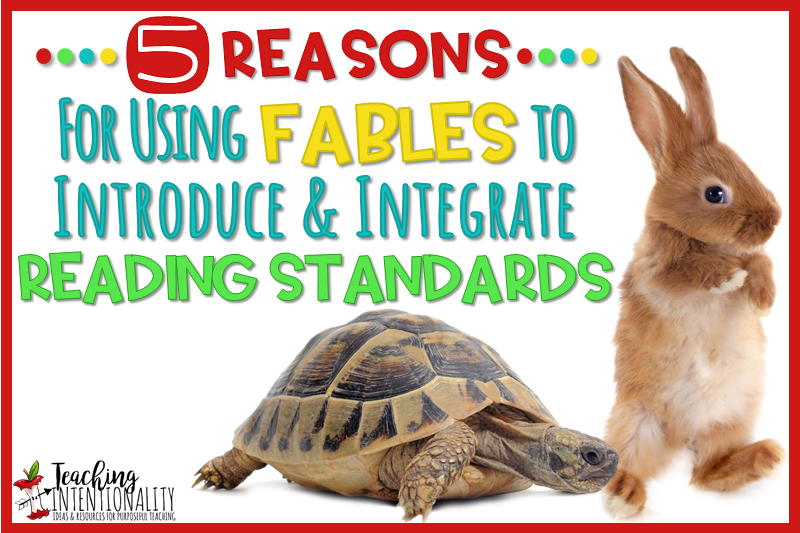 There are a few reasons why I find fables perfect for teaching theme and message. One, the text is short and to the point. Two, fables usually have two characters with opposing traits. 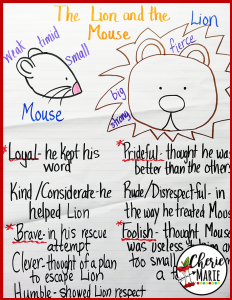 This makes it easier for students to analyze how these traits play out in the plot of the story. 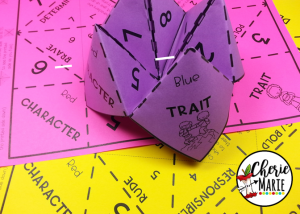 And three, students can clearly see how what happens to the character at the end is directly related to what the character is like (traits) or is a result of their actions or choices. 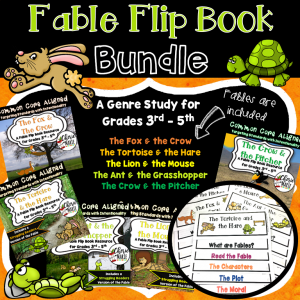 This fable bundle can be found at my TpT store. It is also in digital format. 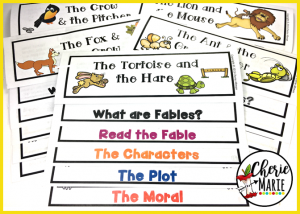 For tips on how Fables are a great way to start teaching themes in literature, see my blog post, 5 Reasons for Using Fables to Introduce and Integrate Reading Standards. where students get it. I love using this book because students also realize that a story can have more than one theme and message depending on the details used to support this. This book is a story with two themes: honesty and courage. The premise on which the Emperor selects his successor is based on these two traits. Ping is honest in presenting an empty pot to the Emperor and admitting to him that his seed did not grow despite his best efforts. 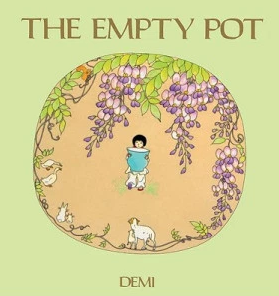 He is also courageous for being the only child who took an empty pot to the Emperor amid all the children who had beautiful flowers to present. Students find two messages within this text: If you are honest with little things, you are trustworthy of bigger things, and it takes courage to do the right thing. It also helps students see that sometimes the title of a book is just as important as the details in the story. Below is a list of titles I’ve found helpful in teaching theme and message. Once students have practice with these types of texts, then they have a better foundation for determining the theme and message within more complicated story plots. crucial. 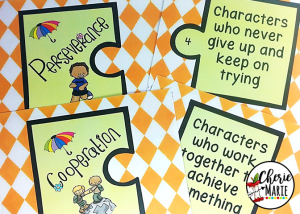 Students need to be able to use theme words such as perseverance and compassion, as well as trait words like determined or considerate. They also need to understand the relationship between theme vocabulary and trait vocabulary. For example, a story about perseverance has characters that are determined in the storyline. A story about compassion usually has characters that are considerate of others’ feelings. Using activities to build students’ vocabulary, not only helps their comprehension but also their ability to communicate clearly. I like to use task card activities, interactive notebook templates, and application activities to build this vocabulary. 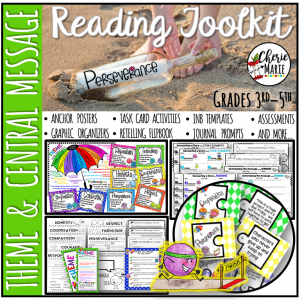 For more resources for teaching–theme and message, visit my shop by clicking on the toolkit below. You can purchase this through my TpT store.